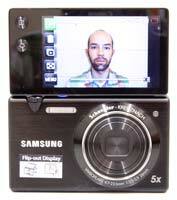 The Samsung MV800 is a 16.1 megapixel digital compact camera that uniquely features a flip-out touchscreen display which makes it easier to capture self-portraits and extreme low or high angled shots. Measuring just 18.3mm in depth, the MV800 also offers a 5x optical zoom lens with 26mm wide-angle setting and dual image stabilisation, 720p HD video recording at 30 frames-per-second, 3 inch touch-screen LCD, wide range of special effects, and the intelligent Smart Auto feature which automatically adjusts the camera's settings. 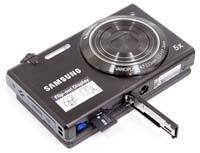 The Samsung MV800 is available in black, red or white priced at £249.99 / $279.99. From the front and in terms of its overall specification, the new Samsung MV800 is very similar to the same company's ST95 model that we recently reviewed. Whereas that camera is firmly in the budget camp, the MV800 is much more of a mid-priced affair. So what could possibly account for the big price difference between the two? The MV800's unique flip-out screen is the answer. Samsung have been trying to make life easier for regular point-and-shooters for the last few years with their innovative dual-screen cameras, and now the MV800 takes things even further. Essentially the 3-inch screen is hinged on top of the body and can be rotated through 180 degrees, so as well as acting as a normal LCD screen on the rear, it can be rotated to face forward in the same direction as the lens, perfect for self-portraits. The screen can also be positioned to stand the camera up at an angle. Note that it doesn't also swivel sideways, which makes it more difficult to achieve some shooting angles than Samsung suggests, and using it to shoot overhead is also tricky as the onscreen icons and the resulting image aren't automatically rotated. The MV800 has a 16:9 ratio 3-inch 'Smart Touch' touch screen now occupies almost the entirety of the rear plate, recalling Samsung's wireless, smartphone-inspired SH100 compact in that respect. Height wise it's about the same size as your average business card too, and the MV800 is just 18.3mm 'thick' at its slimmest point, slender dimensions accentuated by the sleek black finish of our review sample. Overall proportions are a manageable 92 x 56.2 x 18.3mm, and it weighs 121g without the card and battery fitted. That's enough to feel reasonably substantive whilst not uncomfortable if transported in the back pocket of your jeans. Like the ST95, the MV800 has shoehorned in a 5x optical zoom, here starting out a usefully wide angle 26mm (in 35m terms) and running up to 130mm at the telephoto end, with a maximum aperture of f/3.3. Resolution is 16.1 effective megapixels in total from a 16.4MP 1/2.3-inch CCD sensor, while video resolution is fixed at 1280x720 pixels. Whilst that falls short of Full HD, there is at least an HDMI output, alongside the dual USB/AV output in a shared port hidden under a plastic side panel. There's also four slots for the built-in mono speaker. The Samsung is very well constructed thanks to overall a higher degree of metal in the build than plastic. Without anything approaching a handgrip supplied, we did feel like it could slip from our grasp easily if we were too casual with it. A supportive wrist strap and a plastic stylus for navigating the touch screen icons are helpfully provided in the box. Also included is a cursory quick start pamphlet, with the main instructional 'meat' provided via the full manual on CD ROM only. Also omitted from the box is a traditional mains charger as such. Instead, as is now becoming more commonplace, a dual-use short USB lead is provided: one end of which slots into the vacant port on the camera, the other end connecting up to a mains adapter plug. Thus the battery is charged in-camera, meaning that even if you were to invest in a spare cell, the MV800 remains out of action each time you want to recharge it. 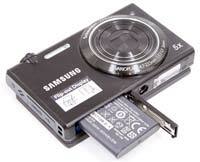 As with recent Samsung pocket models, the MV800 shoots still and video to microSD card, as favoured by mobile phones. We're not big fans when it comes to microSD's use in cameras due to its very small and fiddly dimensions, meaning it's not only very easy to drop but also to lose when removing it to use in a card reader. The SH100's wireless capabilities made this less of an issue, but the MV800 isn't wireless. Doubtless Samsung is trying to make the transition easier for anyone upgrading from one of its smartphone handsets who conceivably might already own such a miniscule card, but there is certainly space here for a full sized SD/SDHC/SDXC slot to have been provided alongside the battery at the camera's base instead. A paltry 10MB internal capacity is however included. The front of the MV800 is smart in appearance, with the zoom lens dominating proceedings. To its top right is a small self-timer lamp/AF illuminator lamp, and over at the other side of the lens, a narrow lozenge shaped strip housing the built-in flash. The matt surface of our black sample is business-like, and, as noted, there's no handgrip of any sorts to get a purchase at the front, and there's nothing at the rear either. Inevitably perhaps we managed to get occasional instances of visible camera shake when shooting handheld at the maximum telephoto setting. A press of the small top plate power button and the MV800 powers up ready for the first shot in just under two seconds, which isn't bad at all. The camera's top plate is unfussy, with a slot for the mono microphone, plus - the largest control here - the shutter release button, which is encircled by a manual zoom lever. Cleverly there's a second shutter release on the back of the camera for use when the flip-out screen is in the 180 degree position for self-portraits. 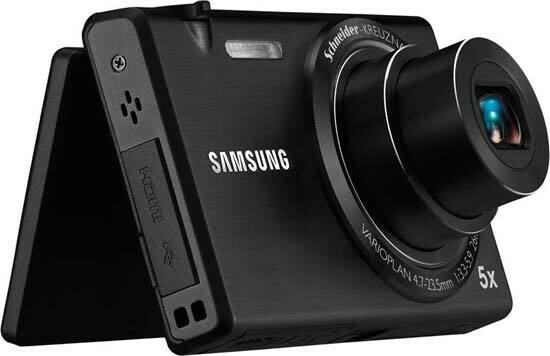 The upshot is that the Samsung MV800's essential physical controls are all within reach of the forefinger or thumb of the right hand; without a second thought just about anyone will be able to pick the MV800 up, take a picture and more or less instantly review it, the camera taking just over a second to commit a full resolution JPEG to memory before the screen clears ready for your next composition. And all without approaching the touch screen if you're not bothered about altering the capture mode, or have previously selected your preferred setting. Novices really don't have to, as Samsung's default Smart Auto setting automatically compares subjects with 16 on-board settings and selects the most appropriate. The only thing that slows down proceedings is a wait of a moment or two while the flash charges if you select that option. Whilst the left hand flank (viewing the camera from the back) is devoid of any features entirely - apart from two fixing screws - the right hand side of the camera features a small lug for attaching the provided strap plus, just above, a covered slot protecting a means of attaching the supplied USB image transfer/battery recharging cable provided and an HDMI cable (not provided). The base of the camera meanwhile features a slightly off-centre screw thread for affixing the MV800 to a tripod, plus alongside this, a sliding catch opening a compartment that houses the battery and aforementioned microSD card. So far, so straightforward. The 16:9 aspect ratio touch screen that swallows up all the backplate real estate is the customary 3-inches in size, and like Samsung's SH100 model has taken inspiration from the smartphone market in the way it presents menu settings as fingertip selectable app-like icons. Its manufacturer has christened this the Smart Touch 3.0 User interface. In review mode the captured image also rotates to display the 'right' way up, whether you're holding the camera on its side, phone style, or horizontally to review or share your pictures. When you're capturing stills the screen image is presented in 4:3 aspect ratio, which means that black bands crop the image left and right. When filming video however, or using a finger to swipe through the app-like icons, the full widescreen can be used. The MV800 includes a selection of 'Smart Filter' digital effects among its app-style iconography, including the familiar pinhole camera-like vignetting feature and perspective warping fisheye. A Smart Album feature can also organize pictures by faces as well as by date. While in normal shooting mode the screen is blank apart from an icon showing the current selected shooting mode, the other icons are summoned up with the press of a 'home' button located in the bottom right hand corner of the backplate, where it's easily overlooked. Press this and the user is given access to five screen's worth of function icons, with 33 options in all. The initial screen shows the Smart Auto icon witnessed on power up, along with Program mode, Smart Movie, Movie, six option Scene mode (landscape, sunset, dawn, backlight, beach and snow and text), 3D Photo, Live Panorama - hold down the shutter button and sweep the camera across the scene - and Self Shot, which frames your face when rotating the screen to 180 degrees and then counts down from 3 before taking the shot. Again, as with the SH100, there isn't a dedicated video record button on the MV800, a now expected feature on even the humblest of compacts, a virtual one has been provided instead. Tap the Smart Movie icon and one unexpectedly appears centre bottom of screen, the red button in the midst of a white square subconsciously recalling the Japanese flag, despite Samsung's Korean heritage. Tap the Program mode icon and what could loosely be termed a function toolbar appears on the left hand side of the screen, allowing the control of flash settings - which summons up a virtual but slightly fiddly 'roll bar' with red eye and slow sync featuring alongside fill in, auto, and automatic red eye fix. Focus mode can also be switched in the same manner - though between auto and macro, with no manual option provided here - as can the self timer options be accessed. At the bottom of the left hand bar is a menu button. Give this a tap with a finger when you're in Program mode and this is where you'll find the ability to control ISO (here ISO80 through ISO3200), incrementally adjust exposure +/- 2EV, control white balance, focus area (centre AF, multi zone AF, smart touch AF or one-touch shooting - the latter as it sounds being the Panasonic-like ability to fire the shutter release by tapping a finger on the screen). Additionally we get the ability to turn face detection on or off, timer and burst settings, adjust photo size and quality, metering (multi, spot or centre weighted), tweak brightness, contrast and saturation in-camera, optical image stabilizer and 'My screen' mode, which displays all your commonly used settings as on-screen icons, all in one place. It feels like Samsung is giving us a surfeit of riches that most of the point and shoot brigade the camera is obviously aimed at will never use. Still, it makes the camera as future proof as possible and staves off any chance of boredom. The second screen of settings continues the almost exhaustive array of options. The first icon is Picture in Picture, allowing you to insert one image within another, then Magic Frame, offering a plethora of rather wild 'n' wacky options for the kids. Next is My Magic Frame, followed by Funny Face, which as the name suggests allows you to bend, stretch and warp your favorite faces. Photo Filter is where not only do we once again find a vignetting option, we also get an increasingly ubiquitous miniature mode, soft focus mode and two old film modes, one black and white the other sepia tinted, and both complete with authentic scratches and blemishes like a damaged negative or old movie reel. With a swipe of the finger we get further access to half tone, sketch, fisheye, defog, classic, retro, oil painting, ink painting, cartoon, cross filter and zooming shot digital filter effects. Again more than we expected from this point and shoot option. Movie Filter is similar albeit reduced (to 11) selection of filters can be applied in movie mode, to include miniature, vignetting, fish eye, half tone and sketch options - which is still pretty cool. Vignetting offers a corner shading vignetting effect to both stills and video - with the ability to further adjust brightness, contrast and the degree/strength of the vignetting via three slider bars. On the third screen we find the self explanatory Beauty mode, a long term feature of the Samsung range and allowing for a degree of retouching and skin tone alteration, Background Blur which digitally produces a bokeh effect, Night Shot, Close Up Shot and Dual IS options, the latter including true optical image stabilisation. The fourth of five screens includes Intelligent Portrait, which takes three different pictures of the same scene at the same time from different angles, Auto Zoom Shot which automatically zooms in on a face, Timer Shot, Touch Shot which takes the image simply by touching the screen, and Pose Guide, which shows your subjects how to position themselves for the perfect shot. The final screen houses Album, Theme Album with Travel, Wedding and Party themes, self-explanatory Slide Show, Photo Editor, in which the image can be cropped and rotated, smart filters can be applied and the brightness, contrast and saturation can be altered, Storyboard Maker, which lets you create storyboards with a choice of layouts and text, Wallpapers for personalising the MV800 with a standard background or your own image, Help and Settings. Delve into any one of these in search of features and, if you don't find what's required, a subsequent press of the 'Home' button acts as a way to return to the main screen. In playback mode meanwhile, accessed with a press of the familiar playback button located on the backplate, the user is presented with a simple array of options at the left hand side of the screen, with the ability first and foremost to delete unwanted images, followed by the ability to view them as a slideshow with music, then to display the shots as a series of thumbnails. At any time a press of the Home button takes us back to those phone app like shooting options, which makes for straightforward and intuitive operation. Though, as we noted at the outset, the camera can merely be left on its default settings and used as a point and shoot compact pure and simple, without engaging with the touch-screen at all.